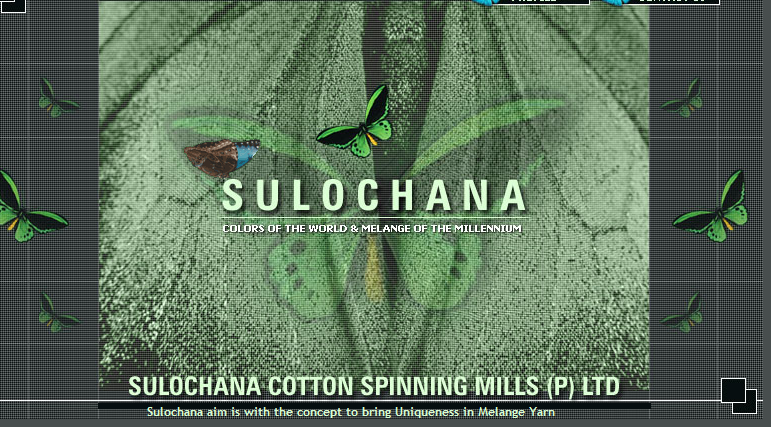 Incepted in the year 1990, Sulochana Cotton Spinning Mills (P) Ltd. is engaged in manufacturing melange yarn of different varieties and counts. Today, it is one among the top Indian suppliers of Mélange yarn which can be directly used in garmenting unlike grey yarn that needs dyeing. It also boasts of the highest capacity to manufacture Mélange yarn in the region. Besides normal Mélange yarn, the company manufactures and supplies huge volumes of special yarns like neppy , slub , grindle , injected slub, snow effect and other special variety yarns. With an advanced manufacturing facility and office right in the heart of Tirupur, Sulochana Mills enjoys the advantage of a strategic location in supplying products to its clients. The mill has been exporting mélange yarn to Bangladesh, China, Egypt, Korea, Malaysia, Sri Lanka, South Africa and more to be added. Sulochana offers melange yarns of Uniform Blended Shades with Latest Technology, the rich Soft superior texture and maintaining quality control with attractive competitive Prices. Sulochana is widely known in the domestic and international Market. Sulochana‘s excellent Melange quality yarn is maintained for cutting edge which renders sheer beauty and value in the fabrics and knits. Among these the usage in tapes, socks, sleeves, sweaters, home furnishings and also in various textile industries. We are proud to announce that our company is accredited with OKOTEX Certification and AZO FREE yarn by contributing to save our earth Precious environment thereby reducing pollution level considerable and maintaining ecological balance of nature. We have 5000 colour shades and textures in the blends and shades of 100% Cotton. The Managing Director Mr. S.Krishnakumar a skilled entrepreneur, a trendsetter for future generation presents the fascinating exotic shades of melange yarns to entice your imagination in knitwear world. This enthusiastic and successful leader of melange yarn is still developing for more innovative ideas to compete with modern needs in the Textile Industry. The mill has started up with a recycled PSF plant which is GRS certified , from which it offers dope dyed fibre and yarn made out of it in any count as required. The PSF as a raw material is been regularly supplied to many socks manufacturers / exporters. ◊ Packing: Highly compressed bales in standard weight of 275 kg. The semi dull polyester fibres can be dyed to get any of your specific colours . 424,426,Kamaraj Road, Tirupur – 641 604. Fax : 91 - 421 - 4321540.